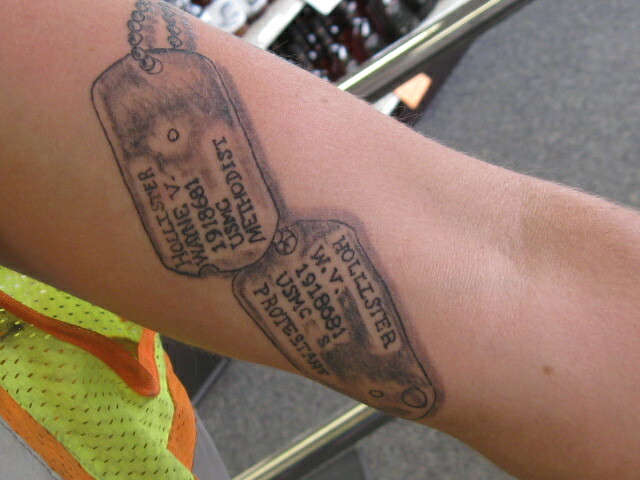 My son has a new tattoo, a set of dog tags not his own. They are the tags belonging to his paternal grandfather, a former Marine. He served 14 years in the service, 3 tours of Vietnam, he has been a Cub Scout leader, a deacon in the church and at 71 he can out work most teenagers (okay that may not be saying much). But this tattoo, on the bicep of my 20 year old son tells me, he is one of the few who get it. He understands the sacrifices his grandfather, and other service men and women made for our country. While you may look at my son and see a tattooed thug, I see a boy who understands and cares about those who gave him the freedom to be himself.